Which TSP fund is right for you? What are the TSP Funds? There are currently five primary TSP funds and an additional five TSP Lifecycle funds also called retirement target date retirement funds. Four of the primary TSP funds are managed by Blackrock Institutional Trust Company to track broad equity index funds (C,S, I) and the US Aggregate Bond index (F). The TSP G fund is internally managed by TSP and invests in non-marketable US treasuries whose interest rate is formula driven. The TSP Lifecycle funds are professionally allocated among the five primary funds as considered appropriate to ones years to retirement. All the funds come with industry beating low administration fees (38 cents per $1000 in 2016). While low fee funds are a must for investors, please do not mistake low fees for low risk. We have seen the stock market lose over 50% twice since 2000 which required a 100% gain to breakeven. Riding a bear market down can cost you the equivalent of 36 years of high fees in only 2 years. Note: I do not advocate high-fee actively managed funds, I advocate avoiding bear markets. All the funds are subject to inflation risk which simply means you have to subtract annual inflation from your returns to obtain your real increase (or decrease) in purchasing power. The TSP G fund's only risk is inflation risk while all the other funds come with market risk which means they can lose value in a down market. The F fund's price moves opposite of interest rates (credit risk) and the TSP I fund is also impacted by the relative change of the US dollar to other currencies (currency risk). A real life risk is assuming past performance is a good indication of future performance. What is the best TSP Fund? Most investors simply look at the past returns of funds to determine which one looks most appealing. The best performing fund during the bull market typically becomes the worst performing in the bear market. As one approaches the end of the bull market, past returns (which are readily available) look their best right when future returns are at their worst. While short term returns are difficult to predict, we follow valuation models that have greater than 90% correlation to determining the 10-12 year returns of the stock market. Expect the equity funds to be no higher than 2017 highs in 10-12 years. What is the best TSP fund in retirement? There is a reason the TSP Lifecycle Income fund designed for retirees holds 80% G fund and only 6% F fund in retirement. No respectable financial adviser would let a retiree dependent on their retirement accounts income in retirement invest heavily in the stock market. While the TSP F fund will outperform the equity funds in a down market, it comes with default risk and can see capital losses in a rising interest rate environment. The TSP G fund interest rate closely matches the TSP F fund yield without the risk of default or capital losses. Because the TSP G fund is available no where else, I highly recommend not withdrawing and rolling your TSP funds into another brokerage account. When you hit retirement and it comes time to reduce risk, it makes more sense to roll your other brokerage accounts into TSP. Private financial institutions can fail too and leave clients with losses. If the US government ever defaults on the TSP G fund we have a lot worse issues to worry about - it will not happen. TSP tip: If you are thinking of rolling out of the TSP when you retire, leave $100 in the account to keep the account open for when you realize you made a mistake. If you withdrawal all your funds, you can not get back in. Avoid getting talked into moving to another brokerage through online forums or financial advisers who recommend other brokerages for more investment options and withdrawal methods. They also come with more fees and you lose that high no-risk G fund interest rate. What is the best TSP fund in a (declining) Bear market? The best performing funds during declining bear markets were by far the no-risk TSP G fund and low-risk fix-income TSP F fund. Those who lost 50% of their money in the last two bear markets in the equity funds required a 100% gain to break-even. Those who know when to step aside are able to take advantage of the great market resets. Embrace the G fund when market risk is elevated. What is the best TSP fund in a (rising) Bull Market? Each of the last three bull markets saw a different equity (stock) fund out-perform but all the equity funds tend to move the same direction (up or down). They just move different amounts at different times. We will point you to some historical charts shortly. It is important to understand the small cap TSP S fund sees deeper bottoms and higher tops. While it has outperformed since the 2009 market bottom, it has under-performed the TSP C fund since 2011. The Life Cycle funds diversify among the five TSP index funds based on your years to retirement. While it is simple to pick your fund, you should consider that diversifying also reduces your gains in a bull market as much as it reduces your losses in a bear market. Lifecycle funds are basically a diversified buy and hold strategy that does not take into market risk which varies significantly over time. Diversifying is not the same as avoiding market risk. What is the best TSP fund today? Many think the best TSP fund for growth is the TSP S fund simply because it has outperformed since 2003 when the funds were all set to a price of $10 a share. We took a look back to 1988 when the index the S fund track came into existence and found the C and S fund are in a dead heat for first place over this longer time period. The International I fund has lagged significantly post financial crisis. 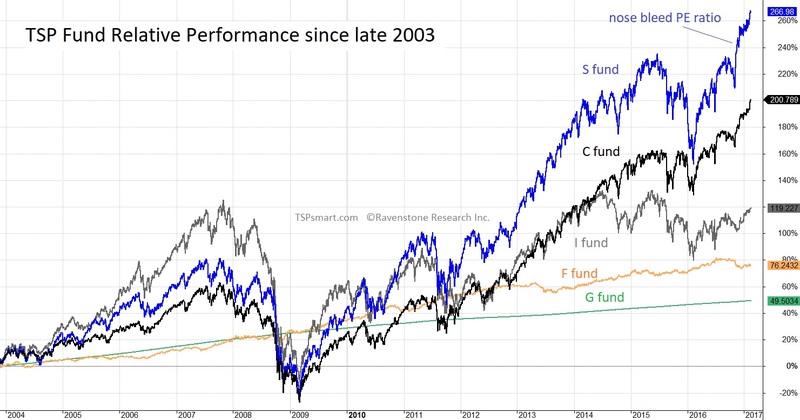 If we look at the relative performance since 2011, the C fund is ahead. Why? In recent years, a few mega-companies have come to dominate the markets (Apple, Google, Microsoft, Amazon, etc). These mega-companies account for a significant portion of the SP500 earnings and available cash. They are in the TSP C fund which holds the 500 largest US companies. There dominance in the economy and in corporate profits has benefited the C fund. The US tech sector also receives about 60% of its revenues overseas, so by owning the TSP C fund which tracks the SP500 index you are getting significant exposure to the international economy. And it is the best part of that economy - tech. 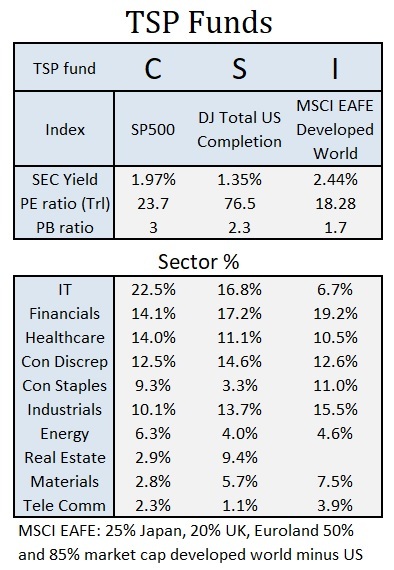 The TSP I fund only derives about 6% of market value from the IT sector. If you want to own international tech, you buy the TSP C fund. Yes the C fund tracks US listed stocks, but these US companies are international in operations. The best fund at any given time depends on many factors: Monetary policy, currency movements, valuation levels of the funds, interest rate direction, and surprisingly the time of the year. The small cap TSP S fund is a more volatile fund than the TSP C fund. This means it sees bigger swings in price both up and down. As you will see, this makes it a prime candidate for a seasonal strategy. Looking back since 1988, we find if you invested in the TSP S fund in the Winter and Spring and the TSP G fund during the Summer and Fall you would have beaten the Buy & Hold strategy by over 4% annualized. Since a picture is worth a thousand words, please review Historical TSP charts for a look at the TSP funds performance over different time frames. As for which TSP fund is the best for growth, it has changed recently year-to-year between the S and C fund based on the factors mentioned above, but all three equity funds are highly correlated in their direction of movement. This means they will both go down together in a bear market when the G and F fund outperform - something to think about as we approach the 2000 stock market bubble valuation levels once again. Investing in the TSP I fund? While not a fan of the international fund, we have to recognize the European and Japanese central bank monetary interventions are very supportive of stocks at times. Often the gains in foreign stock prices are offset by changes in the value of the dollar. Because of this and the lack of tech exposure, I remain biased against the I fund for long term investing. Relying on central banks to prop up markets is not my idea of sound long-term investing. It does provide short-term speculation opportunities. Our guide compares the TSP Lifecycle funds to the Vanguard Lifecycle funds. The TSP Lifecycle Income fund is designed for those in retirement. Otherwise investors are supposed to select the fund with the date the corresponds closest to your expected retirement date such as in the year 2030. See why we are not fans of this concept.